There is a new kid on the block in Vineyard Haven, serving wild mushrooms in a puff pastry with oyster sauce, asparagus soup with caviar wontons, filet mignon, and beer and wine to wash it down. Mon Amour, owned by David and Sarah Spooner, opened last week, and judging by the steady stream of customers last Sunday business is so far, so good. 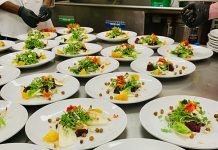 Chef David Spooner is a graduate of the culinary program at the Rhode Island School of Design. And while this is the first restaurant he can call his own, he is no stranger to the industry. Mr. Spooner worked as a caterer for Soigne and was a sous chef at l’etoile. For the past 15 years, Mr. Spooner worked for the Martha’s Vineyard Shipyard. 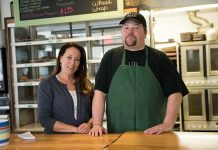 But Mr. Spooner has always wanted to open a restaurant and when Nicky’s Italian Café closed its doors for good, he saw an opportunity and signed the lease on November 15. The Spooners have been painting and cleaning ever since. And their efforts are evident. The space now has a fresh coat of sage green paint, gauzy curtains, and real flowers in the windows. Mr. Spooner’s love of food is reflected in the carefully planned and well-executed menu. Crusty white rolls were served with whipped herb butter. A seemingly simple salad of mixed greens, toasted pecans, cranberries, and goat cheese came with crisp wedges of endive, and it was dressed in extra virgin olive oil and aged balsamic, $11. So as not to confuse the taste buds between salads and filets, a mouthful of lemon sorbet was served in between courses. The palate cleanser came on a small ceramic spoon with a single mint leaf. The simple gesture, which is common at a traditional French meal, felt genuinely hospitable when presented by a cheerful waitress and not at all pompous. Dinner could have been pan-seared halibut on a bed of wilted spinach topped with wasabi lemon beurre blanc, $30, or a grilled veal chop served with spaetzel, veggies, and caramelized onions finished with a red wine demi-glace, $34, or even the seafood medley with sea scallops, shrimp, and asparagus served with saffron basmati rice in a white wine cream sauce, $34. But last Sunday, dinner was filet mignon served with veggies and roasted garlic-black truffle-whipped potatoes in a cognac demi-glace, $36, and grilled organic chicken breast served with Israeli couscous, wild mushroom, cream sauce and veggies, $28. In the kitchen, Mr. Spooner clearly knew what he was doing. The meats were cooked perfectly and were complemented by the sides, which paired expertly with the sauces. Dessert options included crème brulée, almond layer cake, and cheesecake with a graham cracker crust and red wine poached pear, $10. But, should you get caught up in the main course, with no room for dessert, there is coffee, espresso, and tea to end the meal with as well. 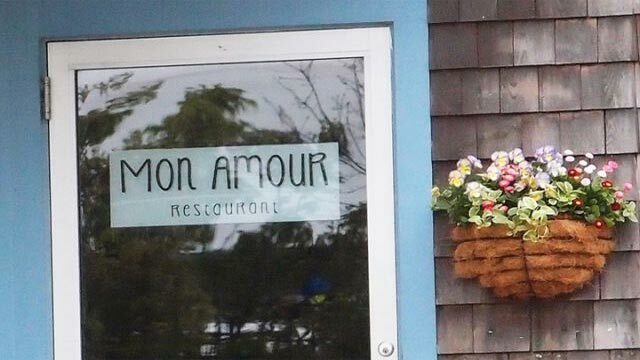 Mon Amour will be open year-round. They are open Thursday through Sunday for now and will be open seven days a week in the summer. Appetizers range from $10 to $14 and entrées $28 to $36. Reservations are recommended but not required. Call 508-693-8444 and check them out online at monamourmv.com. The 12th annual Boston Bakes for Breast Cancer starts next week. 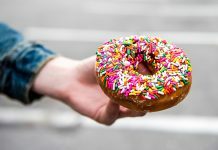 More than 250 restaurants, bakeries, cafes, chocolate, and ice cream shops throughout Massachusetts create a unique dessert for their menu from Monday, May 7, until Mother’s Day, Sunday, May 13. Proceeds will benefit cancer research and care at the Dana-Farber Cancer Institute and Bakes for Breast Cancer Inc., a newly formed nonprofit dedicated to the fight against breast cancer. Be sure to check out Vineyard participants — Chesca’s in association with Cakes by Liz in Edgartown, and The Sweet Life Café, and Offshore Ale in Oak Bluffs. Since Carol Brownman Sneider started the event in 2000, in memory of her mother, Eva Brownman, Boston Bakes for Breast Cancer has raised more than $600,000. This Saturday, at their Cinco de Mayo celebrations at both locations, Sharky’s Cantina will launch its new tequila brand, El Tiburon (“the shark”). “We consider our margaritas to be amongst the best anywhere, and after many years of consideration, we finally found the right company and tequila distiller that we would want to partner with,” said owner JB Blau in a press release. “After being number two in the state behind Gilette Stadium in sales for Don Julio tequila and at one point number two in the state for Patron tequila we figured it was time for us to have our own brand,” he continued. Sharky’s offers free food and entertainment at both locations this Saturday, May 5. The Rick Bausman Beetlebung Steel Band will play at Sharky’s Edgartown at 9:30 pm, and the taco eating contest is at 10:30 pm. El Tiburon will also be available at the M.V. Chowder Company.